Successfully Added Cellphone and Media Player Car Charger with FM Transmitter to your Shopping Cart. This detachable cellphone & MP6 car charger holder with FM transmitter is the most affordable way to enjoy making the most use of your cell phone or media player in the car. This mobile phone & media player car charger holder with FM transmitter enables you to listen to your music via your cars stereo speakers and charge your mobile phone or media player at the same time. This cellphone & media player car charger holder with FM transmitter is suitable for all drivers, designed ergonomically to suite any drivers need with a flexible neck for preferred viewing angle and compatible with any device that is powered by a USB connection at 5V. The great feature about this cell phone & MP6 player car charger and holder with FM transmitter is the FM transmitter function, just adjust the FM frequency from the mobile phone & media player car charger holder with FM transmitter to match that of your car's FM radio frequency, and then enjoy listening to music straight from your cellphone, MP3, MP4, MP5 or MP6 media player. This hands-free cell phone & media player car charger holder with FM transmitter is designed with the user in mind for comfort and easy access of their cell phone and media player functions. This cellphone & media player car charger holder with FM transmitter is in stock now and available at a factory direct wholesale price from the leading providers of consumer factory direct wholesale electronics, Chinavasion. Does this model also work with an iPhone and iPod? Yes, this Cellphone and MP3 MP4 MP5 MP6 Car Charger - Holder with FM transmitter supports both an iPhone and iPod, but it will not charge your iPhone or iPod. Does it matter what make or model my car is, in order for this mobile phone and MP3 MP4 MP5 MP6 car charger holder with FM transmitter to work in it? The make or model of your vehicle does not matter at all, this mobile phone and media player car holder and charger with FM transmitter works with all car makes and models, all you have to do is insert this cellphone & media player car holder and charger into your cars cigarette charger output. 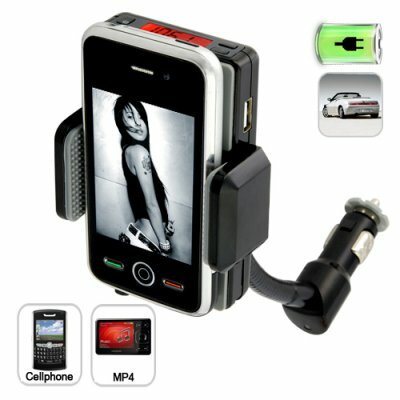 Does this cellphone and MP6 player car holder and charger with FM transmitter come with a MIC for hands free calling? Great quality item and fast shipping. However, like it says in the listing this DOES NOT play well with Iphone/Ipod. It will charge the unit and link up to the Aux jack, but the phone/iPod wont sit right due to the bottom of the craddle being too narrow for the BiG Apple charging connector. on 2010-04-08 03:40:17 Great phone handle. Great for cars that dont have available space for mobile phones. but usb connection may be usable some time to charge it.